Believe or not, I actually like salads a lot, but I never seem to like anything I make at home, which explains the lack of salad entries on this blog. This Cherry Tomato Salad is one of the few rare exceptions. Those who follow me on Twitter or Facebook (yes, I've finally set up a Facebook page! Check it out and "like" it to get updates!) will recognize this as the same salad featured in my profile picture. 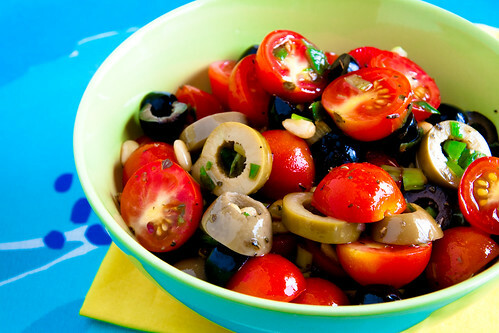 Partly because it is colorful and pretty, but also because it is quite tasty (if you like olives), with a balanced mix of sweetness, saltiness, and tartness. If there is a large bowl of this salad in front of me, you can bet that I'll eat it all before I even realize it! I hadn't made this in a long time, actually, but this week I just felt like something different and refreshing, and this just so happened to fit the bill perfectly.